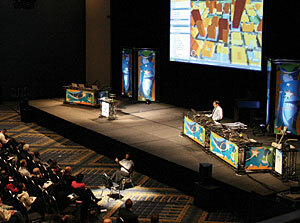 In February, at the Esri Federal User Conference (FedUC) in Washington, D.C., Esri president Jack Dangermond opened the event by pointing out the vast collective knowledge held among the more than 2,000 attendees who gathered to share their expertise with one another and learn from real-world experiences. Quickly turning his attention to challenges occurring around the globe, including a growing population, global warming, social conflicts, and resource shortages, Dangermond said, "Clearly, our world needs a new approachan approach that changes how we see things and do things, an approach that allows us to get more knowledge about and awareness of all of the problems we are facing." He continued, "We need a new approach that allows us to apply what we know to all of the decisions we are collectively going to carry out, and so the notion of a geographic approach is emerging." Moving on to ArcGIS Server, Dangermond explained enhancements to image processing and delivery. "ArcGIS Server is a very strong foundation for managing imagery; it has been for a number of years," he said. "but now it will also serve imagery to any kind of client." Dangermond refers to a fast image service for use in browsers and other desktops that will be part of ArcGIS Server at 9.3 and the inclusion of ArcGIS Image Server as an extension to ArcGIS Server. Previously ArcGIS Image Server had been a separate technology. Also new in the next release will be role-based security, support for a REST API, enhanced mashup capabilities, and more support for varied interoperability standards. With version 9.3, ArcGIS Server will also have additional support for DBMSs, including SQL Server 2008, PostgreSQL, and DB2s on mainframes (zOS), which will allow users to store many types of geographic data in virtually any open source or commercial database or file system. Shifting to a discussion of the geodatabase, Dangermond asserted to the plenary audience that one of the key concepts they should understand about the geodatabase is replication. "This is important for realizing the vision of the National Spatial Data Infrastructure [NSDI]," he said. "This suggests that we can have multiple servers at different locations with copies of the same data, like a central database for the whole country, a regional database, or a database for a state or city. Each can be updated independently with replication services that update each other at a certain set time, be that a specific day, week, or hour." Then, he added, "I can have the same data in multiple locations being updated in a distributed environment with replication services. That entire infrastructure has been built into ArcGIS Server." ArcGIS Server will also support a new mobile application that can be downloaded to a portable device, such as a cell phone, which will support editing, querying, and routing. This application can also task a server to do more sophisticated analysis. Keynote addresses by secretary of the U.S. Department of the Interior (DOI) Dirk Kempthorne and associate deputy secretary of DOI James Cason focused on the advances in and benefits of geospatial technology. Kempthorne has designated Cason as the department's senior agency official for geospatial information. Cason is also the chair of the Federal Geographic Data Committee's Steering Committee and will be the secretary's lead on the newly formed National Geospatial Advisory Committee. Kempthorne spoke to the plenary audience via video about the remarkable technological advances in geospatial technology. Those advances allow people to see the world in a new way and provide the tools for addressing sustainability and managing disasters. He remarked, "The possibilities, indeed the promises, of this technological revolution are literally beyond imagining for both this generation and future generations." Speaking at the Washington, D.C., Convention Center, Cason talked about the future of geospatial technology in the government realm. "The challenge for decision makers is to organize the government so it can collect and coordinate geospatial information across agencies in a strategic way. We need to provide tools so 'can-do' people can perform their work more efficiently and more cost-effectively." For more information, visit www.esri.com/feduc. For an expanded version of this article, visit ArcWatch online magazine at www.esri.com/arcwatch.